Here are luther-postcards made by an artist from Erfurt. On 24. 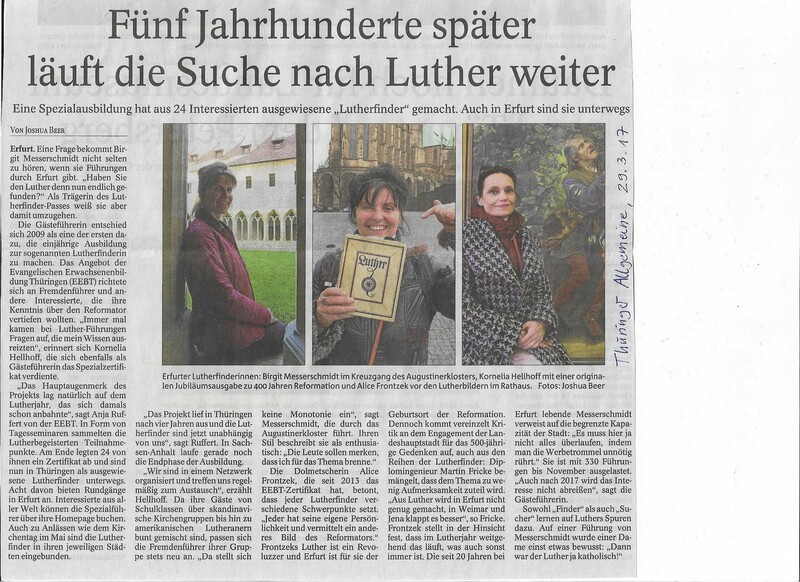 May a group of Lutherfinder visited the thuringian state exhibition: The Ernestines. A dynasty shapes Europe. 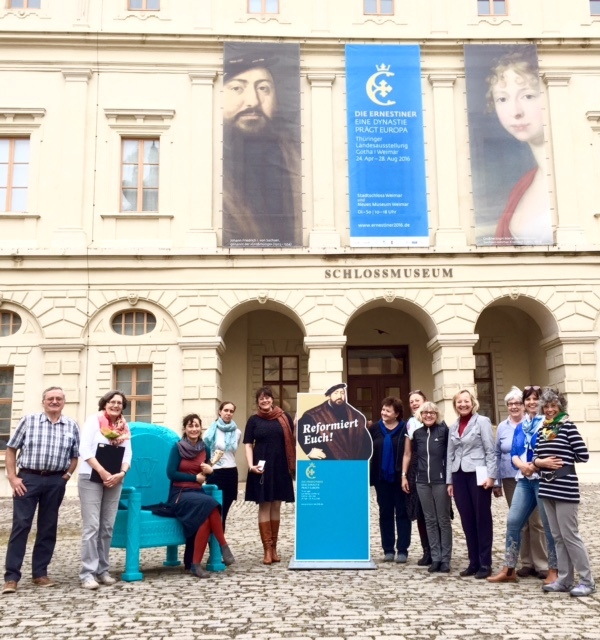 On Sunday, 24 April 2016, Sabine Weiß, Lutherfinder from Jena, will première her new theme-tour: After reading Nostradamus, the duchess of Saxony has accidentally travelled through time to the 21st century… The tour begins at 2:00 pm. Meeting point: Johann Friedrich Monument at the Jena Market Square, duration: 1 1/2 hours. Tickets available before the tour. After the successful reopening of the Luther House in Eisenach in September 2015, the new museum is setting its sights on the 500th anniversary of the Reformation in 2017 - with a permanent exhibition, special exhibitions and a completely new educational museum program. The ideal combination of a city tour and a museum visit. New as of 27 September 2015! We will take you on a guided tour to selected sites in town that are associated with Martin Luther. In the process, your LutherFinder will prepare you for your visit of the restored Luther House. You will become acquainted with the new museum concept. Together with us, you will discover the highlights of the new permanent exhibition „Luther and the Bible“. Repeated, on Sunday, 27. September, a local Lutherfinder will be giving a special tour: „Turbulent times - Mühlhausen after the Peasants’ War“. It had taken longer for the Reformation to be rung into Mühlhausen than in other places. The reasons for that and the hurdles that needed to be taken in the process - and why that led to disturbances - will be explained during the 90-minute tour. It begins at 2:00pm at the Tourist Information Office in Mühlhausen. Booking by the Tourist Information Mühlhausen, Tel. 03601 404770 or about the Lutherfinder from Mühlhausen on this Homepage. On the first Thursday of the month there is a free public tour of the „Kaufmannskirche“ (Merchants’ Church) in Erfurt. This church, with its post-Reformation interior, is considered one of the most authentic Luther sites in Erfurt. The reformer preached here on 22 October 1522 about the „cross and suffering of a true Christian person“. The tour always begins at 2:00pm. The City Museum of Erfurt’s permanent exhibit “Wonderful Years – On the Threshold of the Reformation” displays many exciting items in connection with Luther’s time in a very modern setting. For the very first time, visitors will be able to see Luther’s pen case. This “Federtasche” (Quill Holder) possesses a fully developed system of little boxes stacked on top of each other and used to hold Martin Luther’s various writing utensils. The Luther House museum in Eisenach will remain closed until the middle of 2015 closed due to extensive renovations. The bookstore will remain open during this time! The Creutznacher House (address Markt 9), directly opposite the museum, currently serves as the temporary quarters for the museum. Even during renovations, visitors can see many of the museum's holdings. By 2017, the Luther House in Eisenach will have been developed into a modern museum. The plans include an addition to the historic building with its small, winding rooms. Along with the completion of the museum itself, visitors will be able to experience a new permanent exhibit, “Luther and the Bible”. The concept for this exhibit was developed by Dr. Jochen Birkenmeier. Its content includes: Luther’s Bible translations themselves as well as their cultural-historic influence on music, literature, and language. This exhibit is also supported and accompanied by the theological faculty of the Friedrich-Schiller-Universität Jena under the direction of Prof. Christopher Spehr.